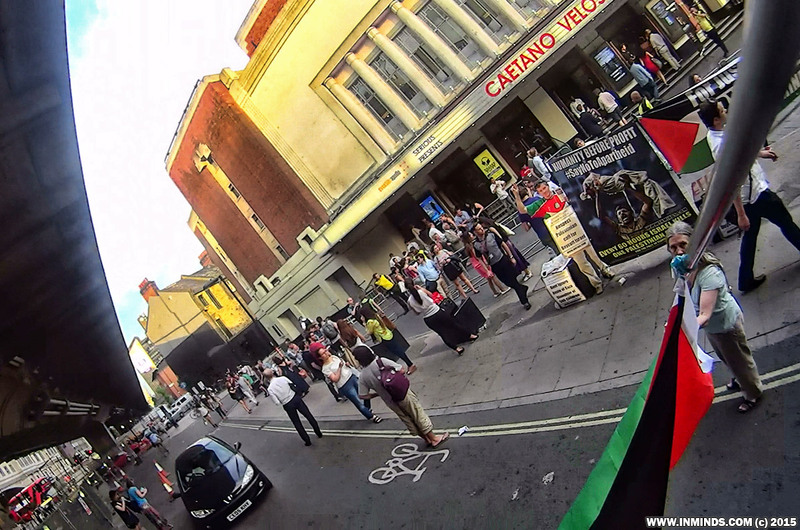 On 1st July 2015 Inminds held a protest outside the Eventim Apollo Hammersmith in London to respectfully ask leading Brazilian artists Caetano Veloso and Gilberto Gil to keep true to the anti-racist Tropicália movement they helped found, by heeding the call of the oppressed Palestinians and boycott apartheid Israel by cancelling their scheduled gig in Tel Aviv on 28th July. Caetano Veloso and Gilberto Gil stood against the military dictatorship in Brazil and for that they were imprisoned and exiled. Gilberto Gil even wrote a song 'Prayer for Liberation of South Africa'. Perhaps it is because of this past history against oppression, that their fans that we met were all very supportive of the protest and deeply hurt that Caetano Veloso and Gilberto Gil seem to have turned their back on the oppressed. The 500 leaflets we printed were very popular and disappeared quickly, and after each speech people came up to us and shook our hands and congratulated us for holding the protest, for voicing their feeling as fans. Out of all the cultural boycott protests we have held over the years, it was this one that we received the most sympathetic response from the fans. 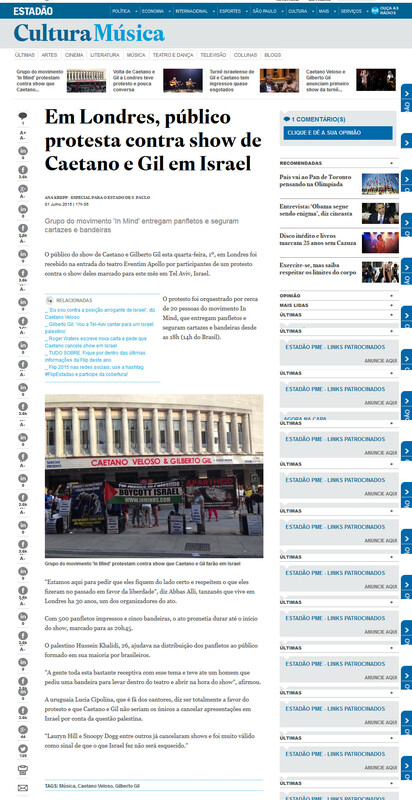 The Brazilian media was also very interested in the story with several publications and radio interviewing us including Estadão and BBC Brazil. 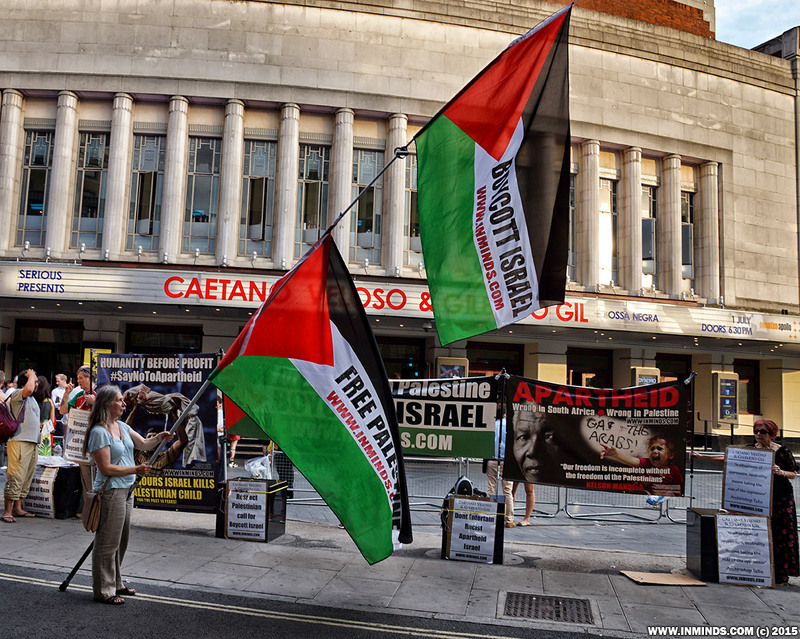 One of the fans asked if she could take one of our Palestinian flags inside to display during the concert, she even insisted making a donation which more than covered the cost of the flag. 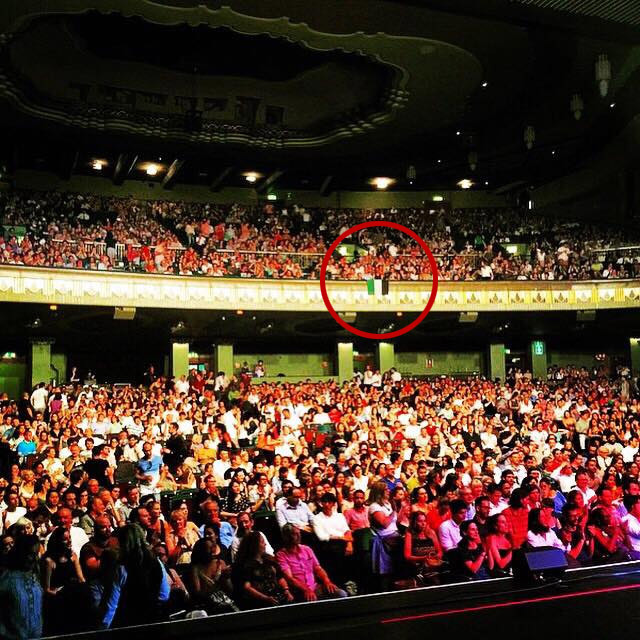 Though we didnt see her again, we noticed photos and video of the concert shot from back stage clearly shows a Palestinian flag hanging from the central circle balcony positioned right in from of the performers so they can't miss it. 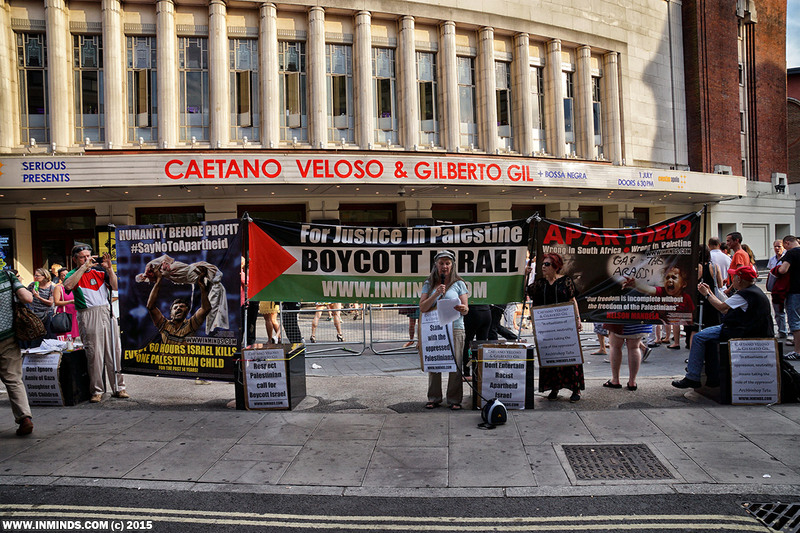 We are here today outside the Eventim Apollo in Hammersmith because we are shocked and saddened to learn that two leading Brazilian artists, Caetano Veloso and Gilberto Gil, who are playing here tonight, who have a history of struggle against injustice, they are scheduled to perform in apartheid Israel on 28th July. So far Caetano Veloso and Gilberto Gil have not heeded the request of the Palestinians living under the yoke of Israeli occupation. Veloso and Gil’s Tel Aviv gig will come days after the first anniversary of Israel's bloodbath in the besieged Gaza Strip in 2014. 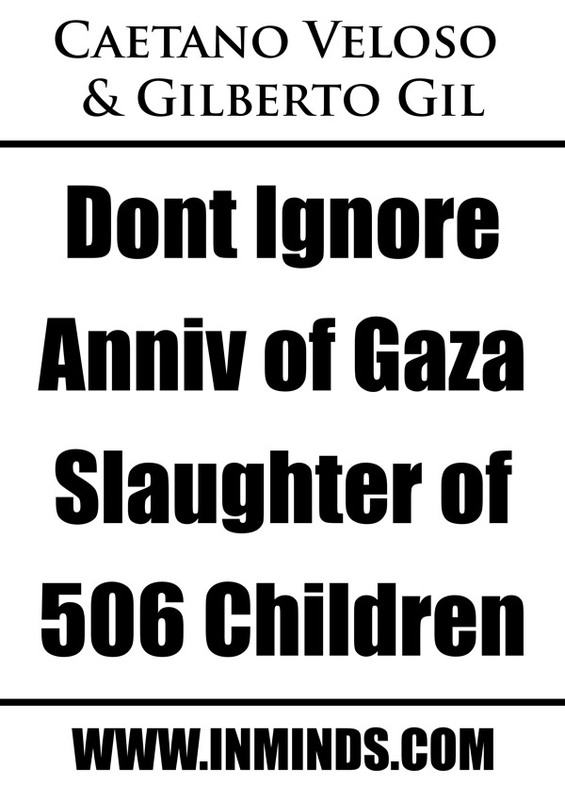 That slaughter left 506 children dead and was condemned as a "massacre" against Palestinian civilians by the Brazilian president Dilma Rousseff. 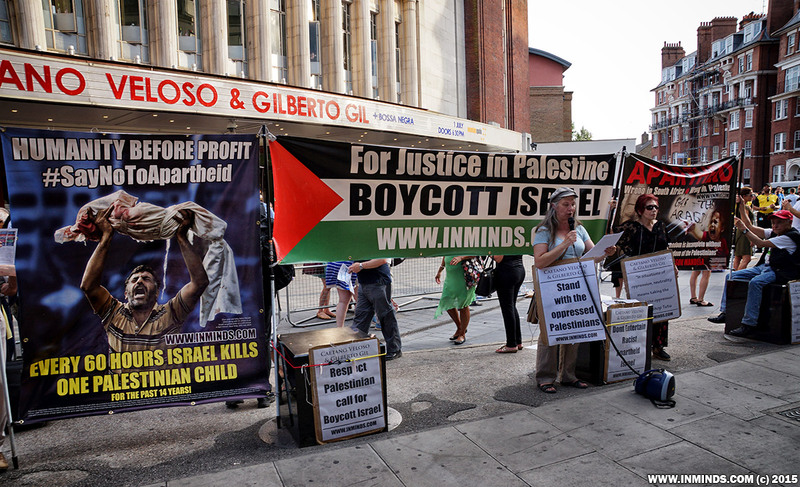 To cross the picket line of the oppressed and perform in Tel Aviv on this anniversary will forever associate Caetano Veloso and Gilberto Gil with that bloodbath by a regime of occupation, settler-colonialism and apartheid that is pursuing the ethnic cleansing of the indigenous Palestinians. Desmond Tutu wrote to them, “I have myself witnessed the apartheid reality that Israel has created within its borders and in the occupied Palestinian territory. ... If we cannot, at the very least, heed the appeals of Palestinian society, to refrain from undermining their peaceful resistance and aspirations for a life without oppression, we will be abandoning our moral obligations. 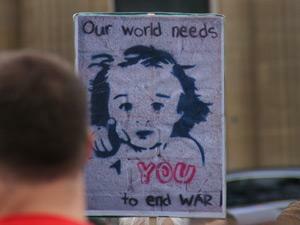 In situations of oppression, neutrality means taking the side of the oppressor". Roger Waters wrote, “Just as musicians weren’t going to play Sun City, increasingly we’re not going to play Tel Aviv. There is no place today in this world for another racist, apartheid regime.” The former Brazilian Human Rights Minister, UN rapporteur and member of Brazil’s National Truth Commission, Paulo Sérgio Pinheiro, wrote: “for the recognition you both have in Brazil and all around the world… for your moral authority for having resisted the dictatorship and for being fighters against censorship, I dare asking you not to perform in Israel.” Besides Roger Waters, prominent international artists like Lauryn Hill, Elvis Costello, Snoop Dog, Carlos Santana, Coldplay, Lenny Kravitz, Cassandra Wilson, Cat Power, Marinah, and Faithless, have all cancelled their performances in Israel. Last week, Thurston Moore, founding member of Sonic Youth, confirmed his support for the cultural boycott of Israel, following his cancellation of a performance in Tel Aviv earlier this year. 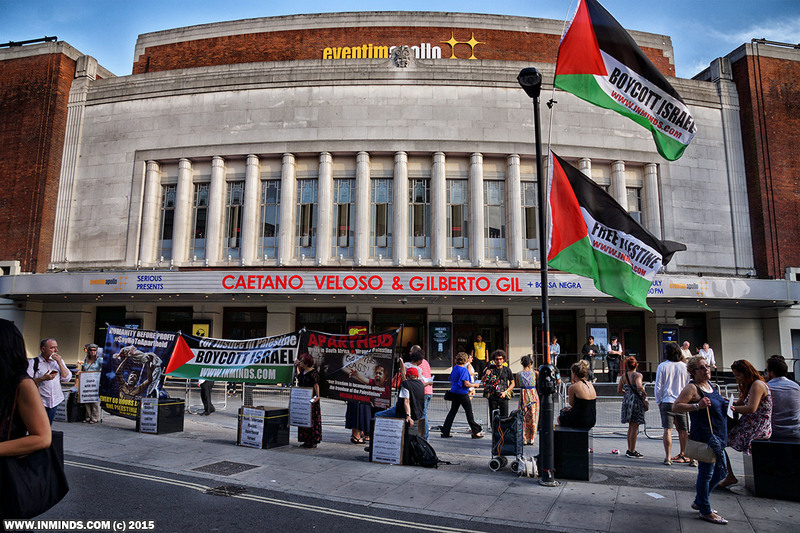 We, along with thousands of their fans, urge Veloso and Gil to respectfully stand with the oppressed, on the right side of history, and respect the Palestinian call for a cultural boycott of Israel by cancelling their concert in apartheid Israel. 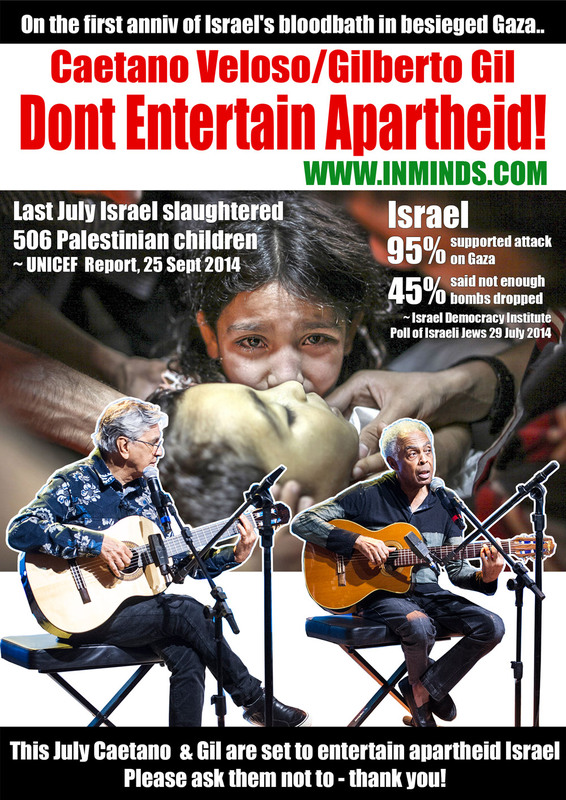 Caetano Veloso and Gilberto Gil dont entertain apartheid! 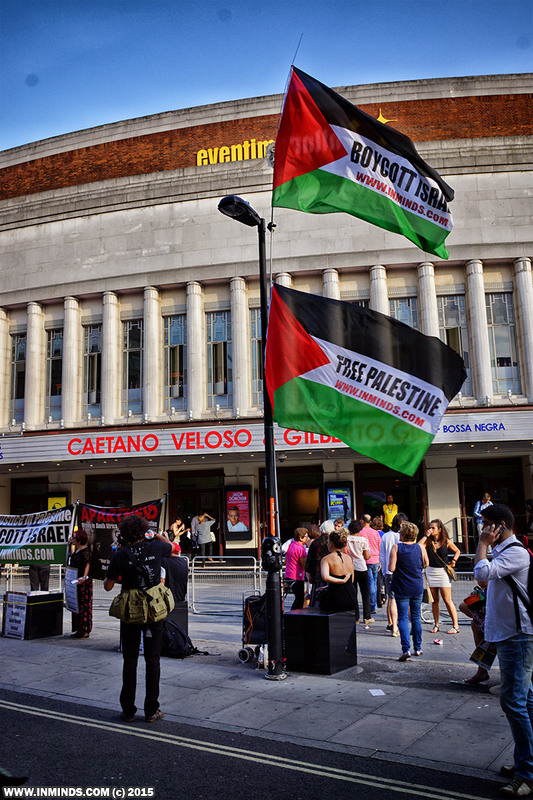 I would now like to read the letter send to Caetano Veloso and Gilberto Gil from PACBI, the Palestinian Campaign for the Academic & Cultural Boycott of Israel, its dated 26 May 2015. 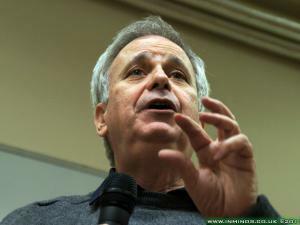 The Palestinian Campaign for the Academic and Cultural Boycott of Israel (PACBI) is deeply troubled to learn that you are scheduled to perform in Tel Aviv on July 28, 2015, while Israel continues unabatedly with its severe oppression against the Palestinian people. Ethnic cleansing of Palestinian communities in Jerusalem, the Naqab (Negev) and the Jordan Valley, building illegal colonies on occupied Palestinian land, and continuing the medieval siege of 1.8 million Palestinians in Gaza are among the direst aspects of this regime of oppression. We urge you not to associate with this regime of oppression by cancelling your scheduled concert in Tel Aviv. 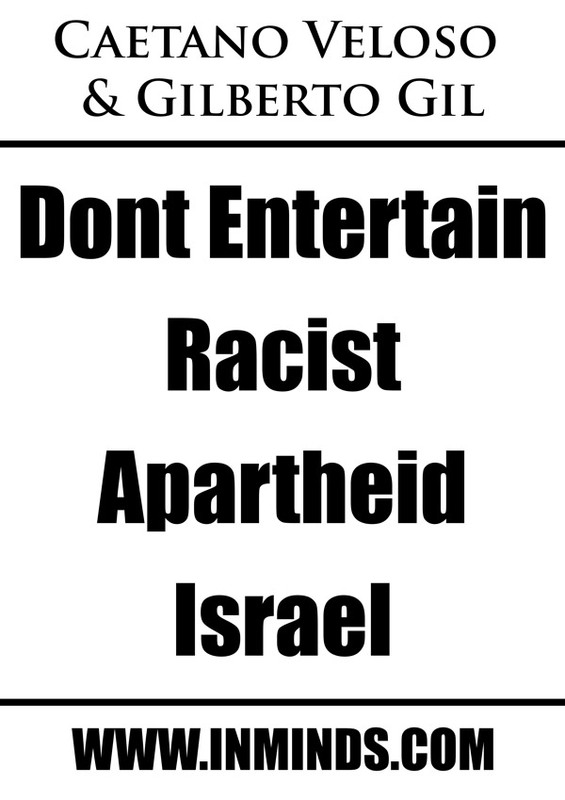 Performing in Israel today is the equivalent of performing in Sun City in South Africa during the apartheid era. 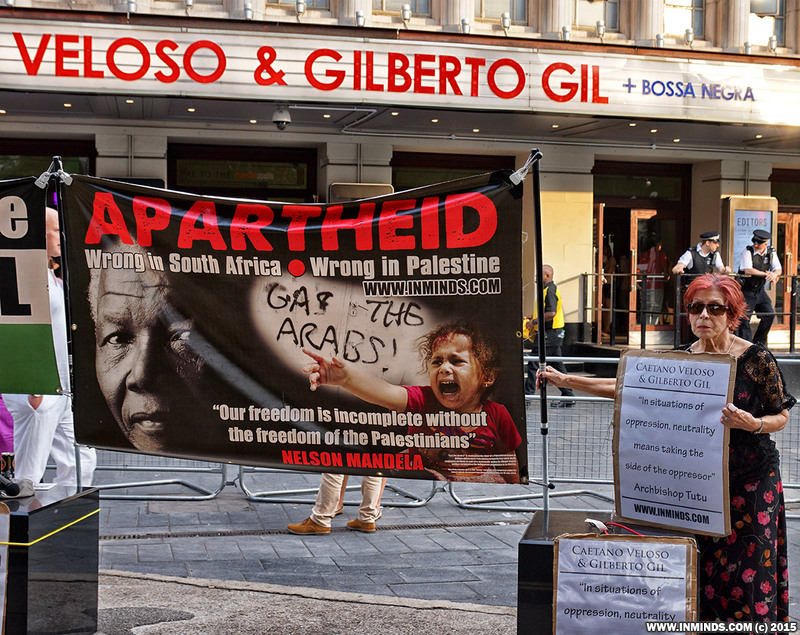 Archbishop Desmond Tutu, who Gil mentions in one of his songs in support of the black South African struggle against apartheid, has repeatedly declared that Israel created an apartheid system that is comparable if not worse to the one that existed in South Africa. Why would two conscientious artists like yourselves lend their name to such a regime? Aside from its occupation and denial of Palestinian refugee rights, Israel maintains more than 50 racist laws that discriminate against its “nonJewish” citizens, the indigenous Palestinian citizens of the state. Even the U.S. Department of State has criticized Israel’s “institutional, legal, and societal discrimination” against its Palestinian citizens. Your scheduled concert would fall right after the first anniversary of Israel’s 2014 massacre in Gaza. 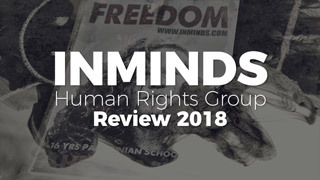 This past summer, Israel committed what some world leaders considered a massacre against the besieged Palestinians in Gaza, killing more than 2,168 Palestinians, including over 500 children. 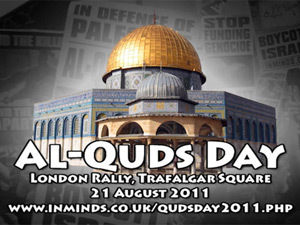 Israel’s 51day long assault annihilated entire families in their homes. All what remains of these families are the official records documenting that they ever existed. A racist Israeli chant mocked the hundreds of Palestinian children murdered by Israel during its massacre in Gaza: “ Tomorrow there’s no school in Gaza, they don’t have any children left.” Singing in Tel Aviv, some 70 km away from the besieged Gaza Strip, would send all Palestinians the message that our lives do not matter and our human rights are not worthy of consideration. Today, the latest target of Israel’s racist policies are the approximately 60,000 African migrants and asylum seekers who have crossed into the country for shelter from persecution and abject poverty in their home countries. Instead of offering them protection, Israel regards the African migrants as a “cancer” and a threat to the “character of the Jewish identity of the state.” Under its repressive laws African asylum seekers can be imprisoned for up to a year and unlawfully offered a small monetary sum to leave the country. 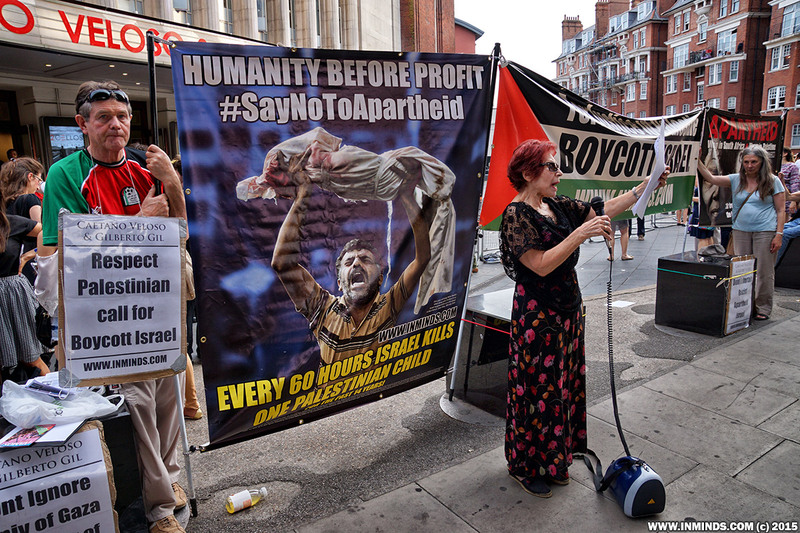 The struggles of the indigenous Palestinians and the African asylum seekers would be best served if you to stake a principled stance against Israel’s racist and colonial oppression by refusing to entertain Israeli apartheid. Please do not perpetuate the silence and the wall of denial that stops the world from seeing the daily realities of degradation, racial terror, land theft, ethnic cleansing that we Palestinians are struggling against, and similarly prevent people from acknowledging the racist exclusion and repression that African asylum seekers are resisting. In 1969, both of you were imprisoned by the Brazilian military government because of the political content of your songs and you were only able to write your music freely while in exile in London. Millions of Palestinians are now languishing under Israel’s regime of occupation, colonization and apartheid. More than 5,000 are in Israeli prisons, of whom at least 500 are children. We hence, appeal to you as we have appealed to conscientious artists all over the world to refrain from playing in Israel, as was done against apartheid South Africa, until it recognizes our rights under international law. Aside from Elvis Costello, prominent international artists from Roger Waters, Sting, the late Gil Scott Heron, Snoop Dog, Carlos Santana, Coldplay, Lenny Kravitz, Cassandra Wilson, Cat Power, Lauryn Hill and Faithless, among others, have all cancelled their performances in Israel. 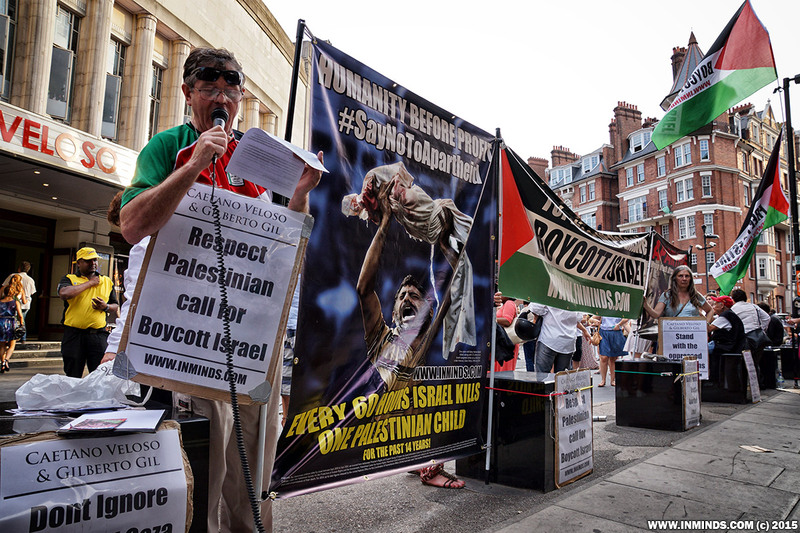 PACBI and the broader BDS movement, representing the absolute majority of Palestinian civil society, thus appeal to you to respect our struggle. 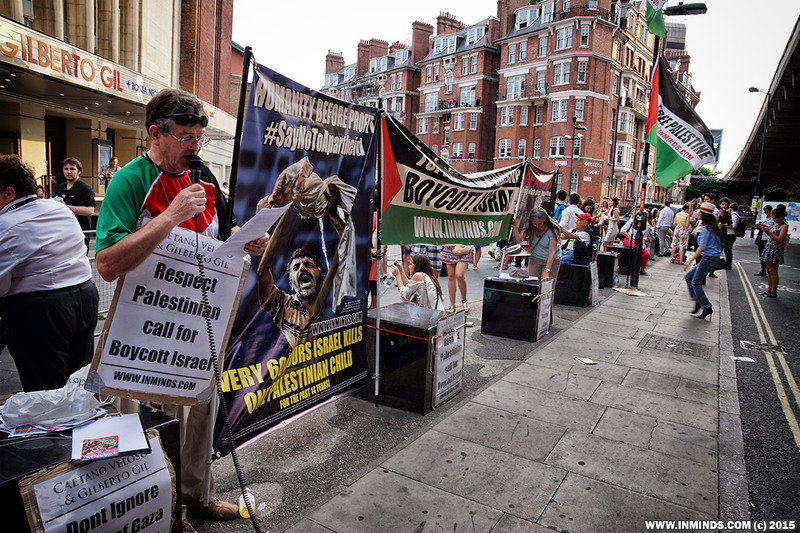 We ask you to uphold our strategy of nonviolent resistance and refrain from crossing a picket line called for by Palestinian society, endorsed by international organizations, and increasingly supported by progressive Israelis. 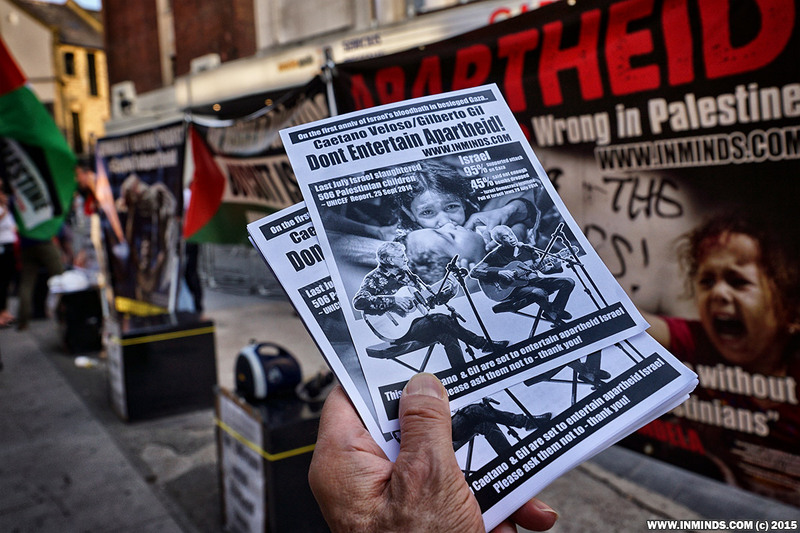 We urge you to heed our call by refusing to entertain Israeli apartheid. 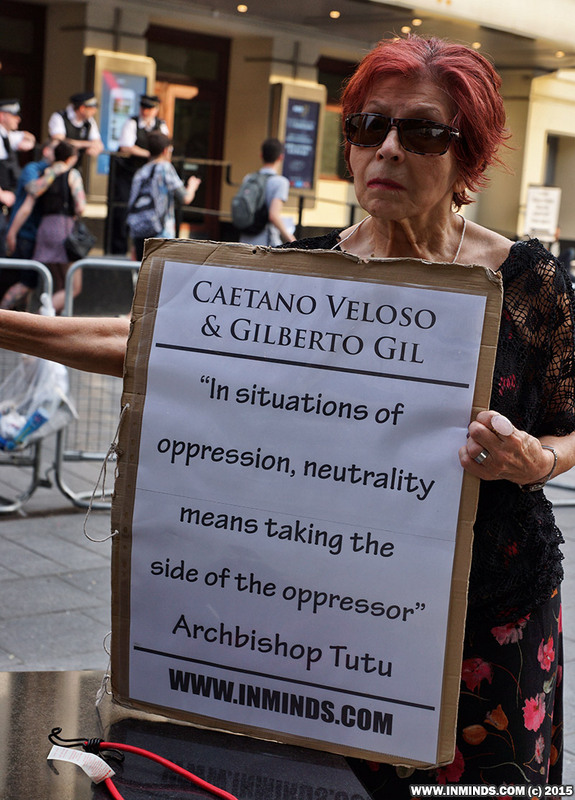 On 12th June Archbishop Emeritus Desmond Tutu wrote to Caetano Veloso and Gilberto Gil. The letter reads..
We South Africans suffered decades of apartheid and can recognize it in other places. I have myself witnessed the apartheid reality that Israel has created within its borders and in the occupied Palestinian territory. I have seen the occupied, colonized and racially segregated streets in Hebron, the Jewish-only colonies, and I have walked by the Wall that divides Palestinian families in Bethlehem and denies their children normal access to school. I have seen the racialized ID systems, different-color car plates, and the racial laws that discriminate against Palestinians. 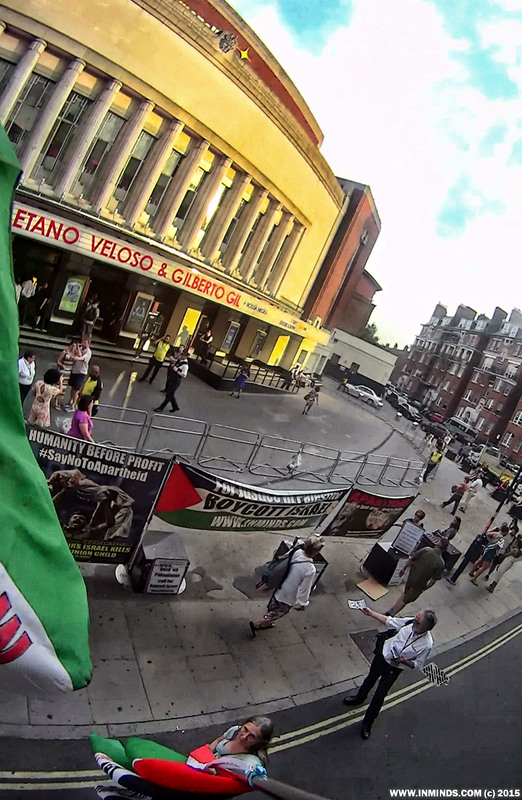 My dearest Caetano and Gil, I have seen Israeli apartheid in action. But I have also experienced the nonviolent struggle of the Palestinian people to end the regime of oppression that denies them their rights and dignity. 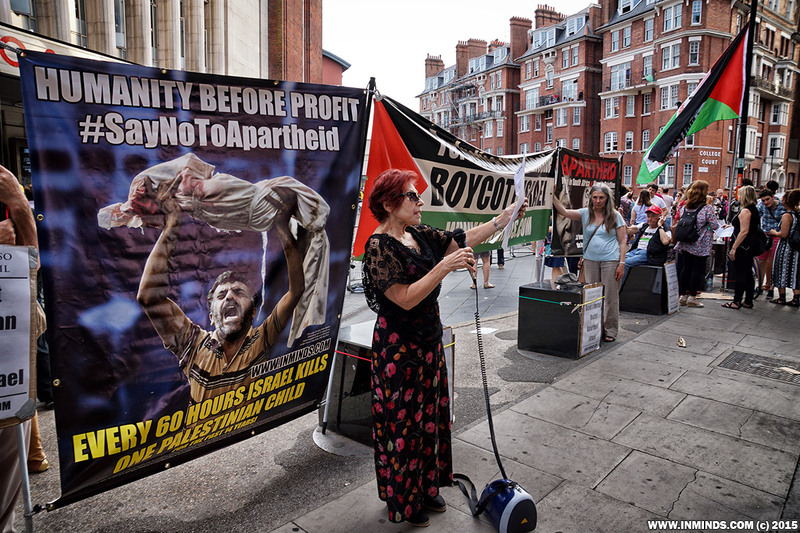 They have appealed to the world to apply pressure on Israel, as was done against apartheid South Africa, to end the occupation and violations of international law. 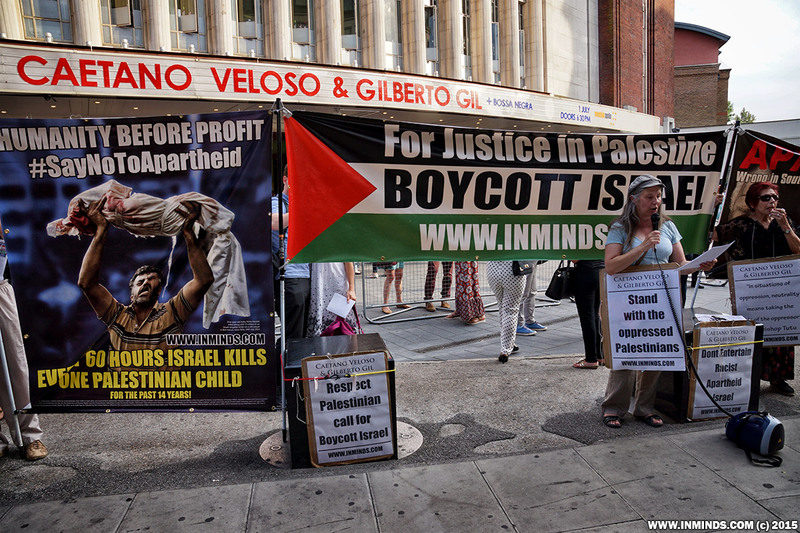 I have supported their nonviolent boycott, divestment and sanctions (BDS) movement that seeks justice, freedom and equality for all. If we cannot, at the very least, heed the appeals of Palestinian society, to refrain from undermining their peaceful resistance and aspirations for a life without oppression, we will be abandoning our moral obligations. 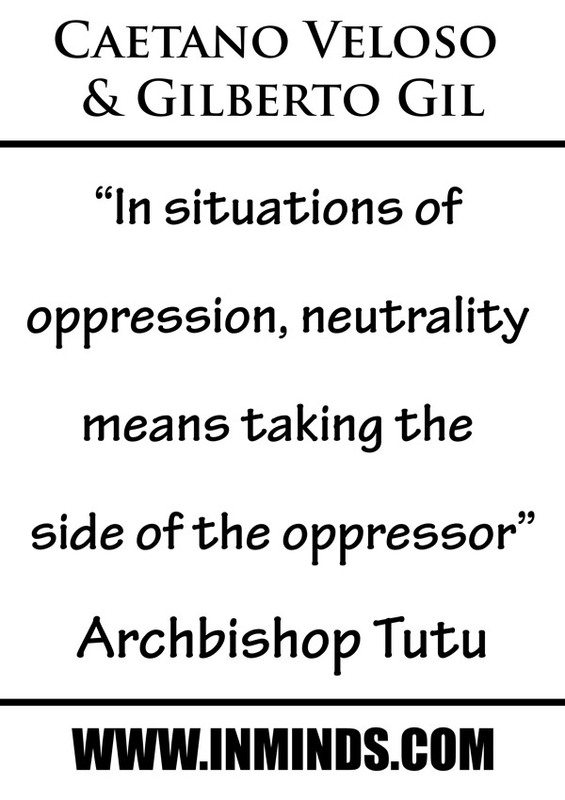 In situations of oppression, neutrality means taking the side of the oppressor. Without the international isolation of the apartheid regime in South Africa, including support for the cultural boycott, we could not have reached our freedom. Conscientious artists who refused to play Sun City contributed to our march for freedom, and we deeply appreciated their solidarity. 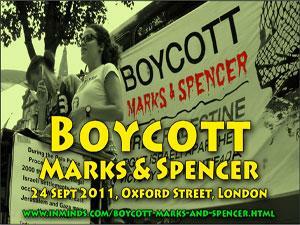 You yourselves stood with us in the face of apartheid. 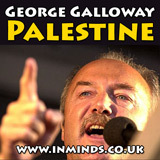 So can you support the Palestinian pursuit of dignity and rights. Your performance is scheduled next month, a year after the latest brutal Israeli attack on the occupied and besieged Gaza Strip. Thousands of Palestinian sisters and brothers were killed and many more remain homeless. At that time, I witnessed the biggest demonstrations we ever had in South Africa since we liberated our country from apartheid. The streets of Cape Town were taken by thousands of South African men and women, young and older, standing in solidarity with the Palestinian people. You, Gil, even sang for us, “Make red all the blue blood.” You sang for “the lord of the African jungle,” saying it is “sister of the American jungle.” I add, our jungles are also sisters of the occupied Palestinian Jordan valley, of the olive trees in Jerusalem, and of the citrus orchards of the Holy Land. I appeal to you to cancel your performance in Israel until the time when freedom reigns and your music cannot be exploited by an oppressive regime to cover up and perpetuate oppression. 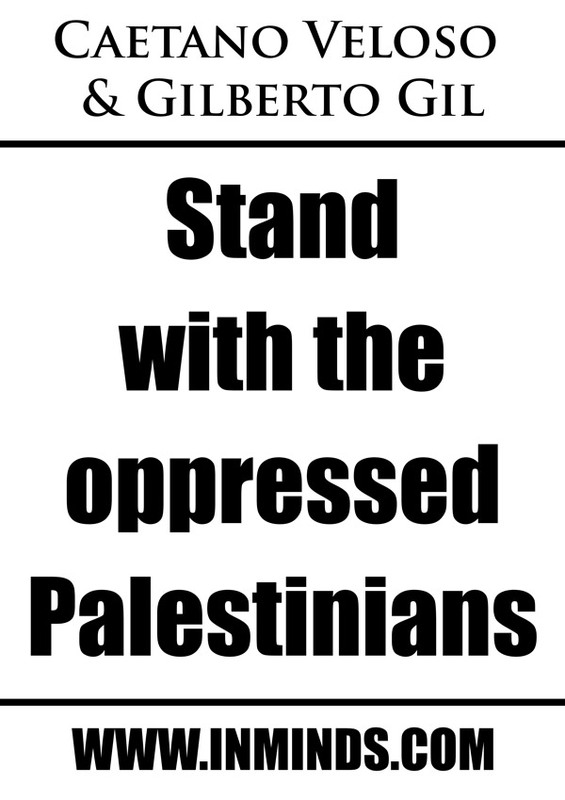 Only then can all Palestinians -- and Israelis -- live without oppression and truly enjoy your music. 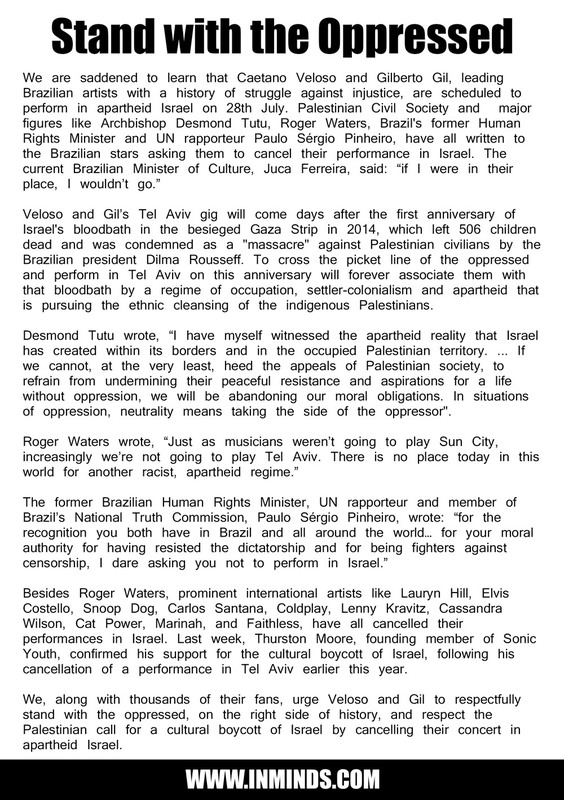 On 22nd May the musician, singer-songwriter and composer Roger Waters wrote to Caetano Veloso and Gilberto Gil. The letter reads.. I look at your photographs, I listen to your music, I read the history of your personal and professional struggles, I am reminded of all the struggles of all the peoples who have resisted imperial, military and colonial rule down the millennia, who have fought for 'the imprisoned and the dead.' It has never been easy, but it has always been right. We face a similarly momentous opportunity now. We stand at a tipping point. Those of us who are convinced that the right to a decent human life, and to political self determination, should be universal are, in concert with 139 voting Nations at the General Assembly of the United Nations, now focused on Palestine. Israeli Prime Minister Netenyahu, with his teetering far-right government, reminds me of the story of The Emperor's New Clothes; there surely never was a cabinet more nakedly exposed in their calumny than this. They damn themselves with every breath they take, every racist speech they make. "Look Mummy, The Emperor has no clothes!" I had occasion recently to write a letter to a young English entertainer, Robbie Williams; I shared with him the fate of four young Palestinians playing soccer on the beach in Gaza who were killed by an Israeli artillery shell. Why would I bring up a beach and soccer? Why? Because I love Brazil, I have Ipanema Beach in my mind's eye; I remember gigs I have done in Sao Paulo, Porto Allegro, Manaus and Rio. How could I ever forget them? I have a football shirt, signed, "To Roger from your Fan Pele". When I was last there, an innocent child had just been killed, dragged behind a car by criminals escaping the scene of a crime. The national remorse was palpable, it was all encompassing, you, all of you, cared for that poor kid. In so many ways, you are a beacon of light to the rest of the world. When all this is over, we will go to the Holy Land, we will sing our songs of love and solidarity, we will gaze at the stars through the leaves of the olive trees, we will smell the wood smoke from the fires of our hosts, we will treasure the legendary hospitality. But, until this is over, until all the people are free, we will plant our emblem in the sand, there is a line we will not cross, we will not entertain in the court of the tyrant king. 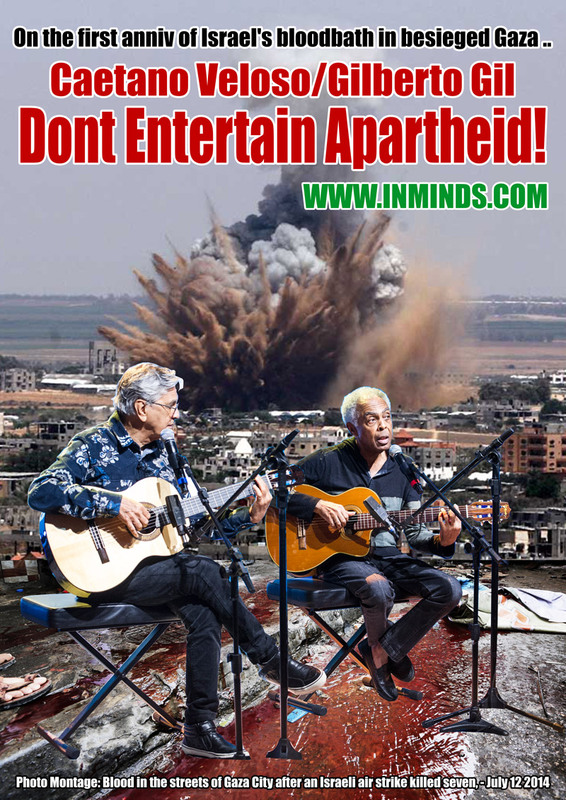 Dear Gilberto and Caetano, 'The imprisoned and the dead' reach out, please, join us in this by cancelling your gig in Israel. Thank you for taking the time to reply to my letter. Dialogue is truly important. I will respond to the points you have raised. I fear you may be viewing Israeli politics through rose tinted spectacles. 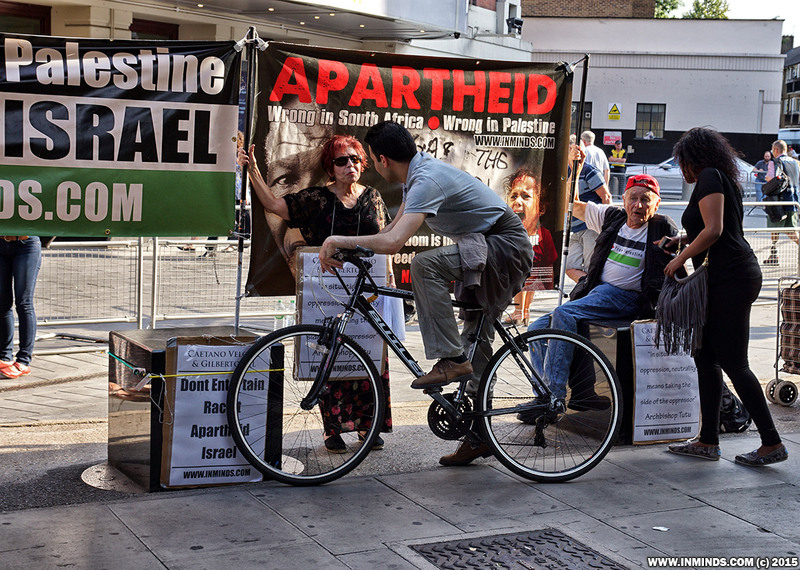 The fact is that for the many decades, since the Nakba, (catastrophe, dispossession of the Palestinian people) in 1948, Israel’s colonialist and racist policies have devastated the lives of millions of Palestinians. The BDS movement, which I am asking you to join, is a global movement that demands Palestinian freedom, justice, and equality. It is growing rapidly because of increased international awareness of the oppression the Palestinians have had to endure these last 67 years. Netanyahu’s current extreme rightwing regime is just the latest government perpetrating cruel acts of injustice and colonization. But this is not just a right wing problem. It was, in fact, the leftwing Labor party that founded the illegal settlement program and also failed to end the occupation of Palestinian land and make peace. 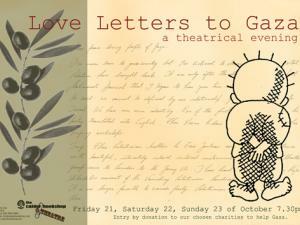 In your letter you say that JeanPaul Sartre and Simone de Beauvoir believed in Israel before they died. That maybe so, but that was then and, maybe then, they didn’t know about or understand the brutality of the Israeli occupation of Palestinian lands and subjugation of its people. But, I do know this, the wine and coffee splattered floorboards of the Café Flores and Les Deux Magots would today reverberate with the sound of JeanPaul Sartre and Simone de Beauvoir turning in their graves to hear their names taken in vain and nailed to the mast of the occupation and oppression of the Palestinian people. 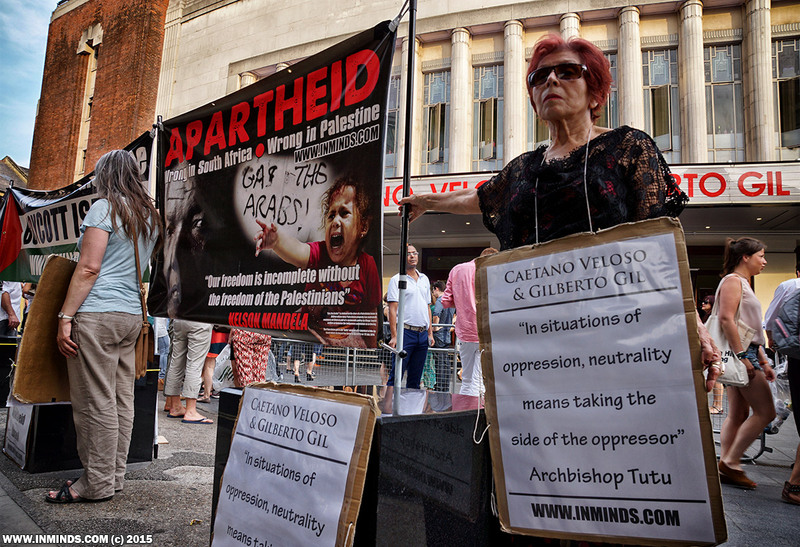 You mention Archbishop Emeritus Desmond Tutu, he is among those embracing BDS, as he has observed Israel’s actions and has deep empathy for The Palestinian People. There is, as he noted to you, apartheid in the occupied territories that is just as definite and dehumanizing as it was in apartheid South Africa when the infamous and racist pass laws were in place. 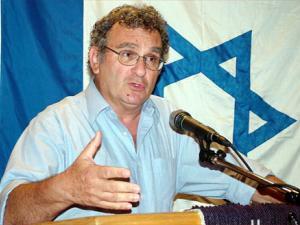 As in South Africa, Palestinians and their legal rights are defined by their racial and religious background. 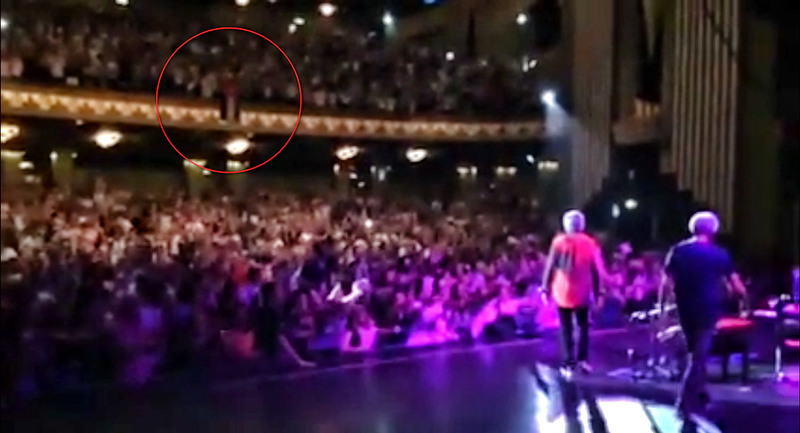 Can you imagine such a thing in Brazil or England or the USA or Holland or Chile, or? No. Why not? Because it is unacceptable, that’s why not. Caetano, if I may pose a question, why would you not reject complicity with such injustice now, just as surely as you would have rejected white racism against South Africa’s black population back in the eighties? 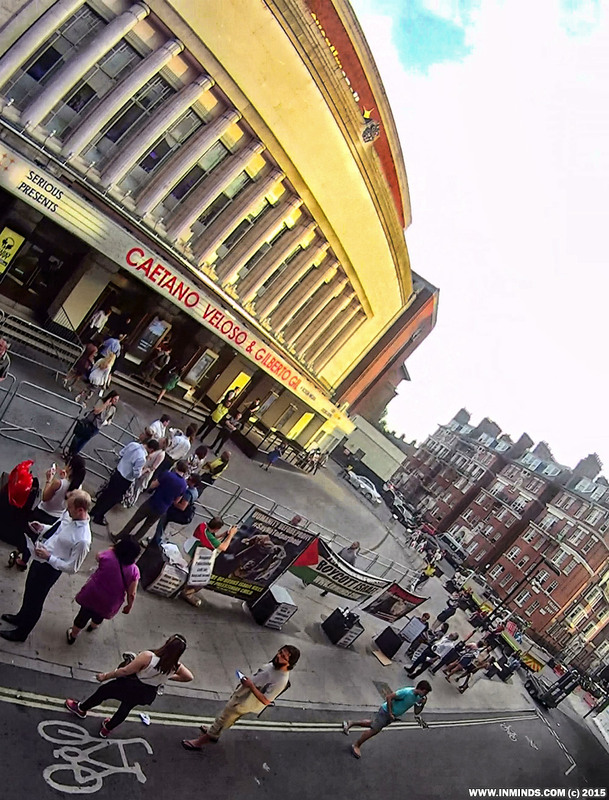 Your letter suggests you believe your upcoming gig in Tel Aviv can help change Israeli policy. I would suggest this is a naïve proposition. Sadly, it is not just the Israeli government that needs a change of heart. Polls indicate that a staggering 9 5% of the Jewish Israeli public supported the 2014 bombing of Gaza,(561 dead children), 7 5% do not support a Palestinian state based on the long negotiated ’67 borders, and 4 7% believe Palestinians citizens of Israel should be stripped of their citizenship. No, Caetano, playing a gig in Tel Aviv will not move the Israeli government or the majority of the Israeli people one jot, but it will be seen as you giving tacit approval to the status quo. 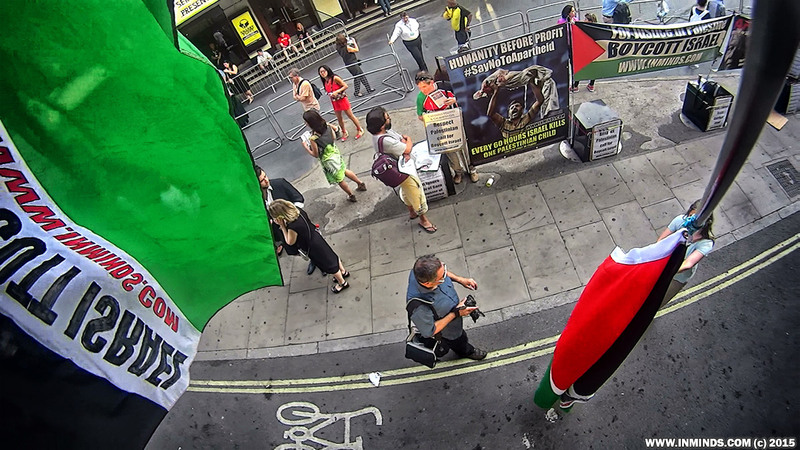 Your presence there will be used as propaganda by the right and will provide cover and moral support for the Israeli government’s outrageously racist and illegal policies. 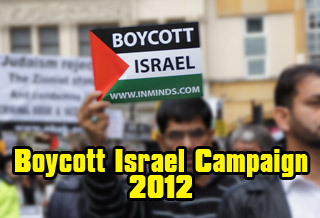 It is a dilemma I know, but, if you really wish to influence the Israeli government, you will join us on the BDS picket line. We are having a powerful effect, as we can see from their reaction, the bullies coming out in full force to try to crush the voices of dissent and silence us. We will not be silenced, we are strong, and together we can help free not just the Palestinian people from the yoke of Israeli oppression, but also the Israeli people from the oppression of their own exceptionalism and dogma, which is deadly to both peoples. I implore you not to proceed with your engagement in Tel Aviv, instead take the opportunity to visit Gaza and the West Bank and see for yourself what Sartre and de Beauvoir never lived to see. I believe your resolve to perform in Tel Aviv will dissolve in a sea of tears and regret. Caetano, I do not know you, we have never met, but, I believe you mean well and I bear you no ill will. If you go to Tel Aviv in spite of our heartfelt entreaties, and if you visit Gaza or the occupied territories, you may well experience an epiphany. 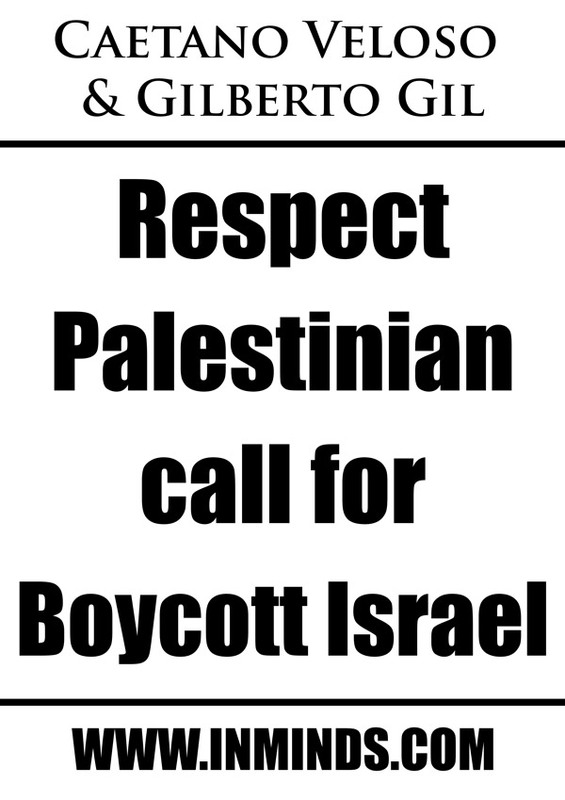 If you do, please reach out to us, all of us, not just in the Palestinian and Jewish communities, but all of us in solidarity in Brazil and elsewhere, all of us in BDS all over the world working for justice and equal rights in the Holy Land We will embrace you. I thank you again for joining this conversation. 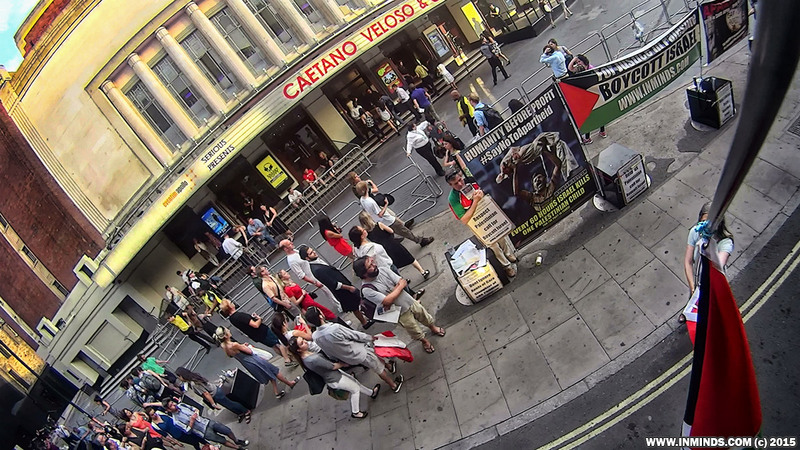 Please go and see things for yourself, but w ithout performing there, without crossing the Palestinian boycott picket line. Maybe UNWRA can help, they certainly helped me when I was looking for the reality. Go and see for yourself, you will not have to use your imagination. The reality is devastating beyond anything you could possibly imagine.